Musings on family history, regional history, book reviews, and miscellaneous observations and comments by a genealogist and librarian living near the Great Smoky Mountains in East Tennessee. Pitre, Brant. Jesus and the Jewish Roots of Mary: Understanding the Mother of the Messiah. New York: Image, 2018. Before I begin this review, I want to mention that I'm a Protestant and a seminary graduate. The review is written from my theological perspective. I know some will disagree with my thoughts on the book. That's okay. We can just agree to disagree. Now for the review: I looked forward to a book on the Jewishness of Scripture; however, this book fails because of flawed theology. It venerates the Virgin Mary rather than glorifying God and Christ. I'm thankful to attend a church where the pastor rightly divides the Word of God and brings out the Jewish context of the Scriptures while emphasizing the One who is worthy of worship -- and it's not Mary. This review is based on an advance electronic copy provided by the publisher through NetGalley with the expectation of an honest review. Wilkinson, Ellen. The Division Bell Mystery. Scottsdale, Arizona: Poisoned Pen Press, 2018. A gun's discharge disturbs those dining in a parliamentary dining room. They find an American capitalist who is a Parliamentary member's guest dead. At first glance, it appears a suicide, but a robbery attempt in his rooms, further investigation, and his granddaughter's insistence he would not end his own life make them suspect homicide. With no one else in the room and no way for someone to leave without being seen by the member of parliament discovering the corpse, how did the murderer get away? The room is sealed. Jenks, who had been assigned to the businessman, turns up dead in the robbery attempt. A notebook written in cipher by the American was among his effects. How did he gain possession of it? It's an interesting whodunit from the golden age of mysteries. The author, a parliamentary member, provided glimpses into the life of a member of the House of Commons. I received an advance electronic copy from the publisher through NetGalley with the expectation of an honest review. Gribble, Leonard. The Arsenal Stadium Mystery. Scottsdale, Arizona: Poisoned Pen Press, 2018. When a soccer player collapses and dies at a London stadium, it is up to Inspector Slade to catch the killer. He always gets his man. With little cooperation from those most likely to know anything useful, it is challenging. The man was not popular, and motives or potential motives abound. Slade suspects the murder is connected to the death of a girl a few years ago. He just needs to make the puzzle pieces fit . . . and he finally does. I enjoyed this Golden Age mystery and would love to read more books with Inspector Slade. I received an advance electronic copy from the publisher through NetGalley with the expectation of an honest review. Shaw, M. B. 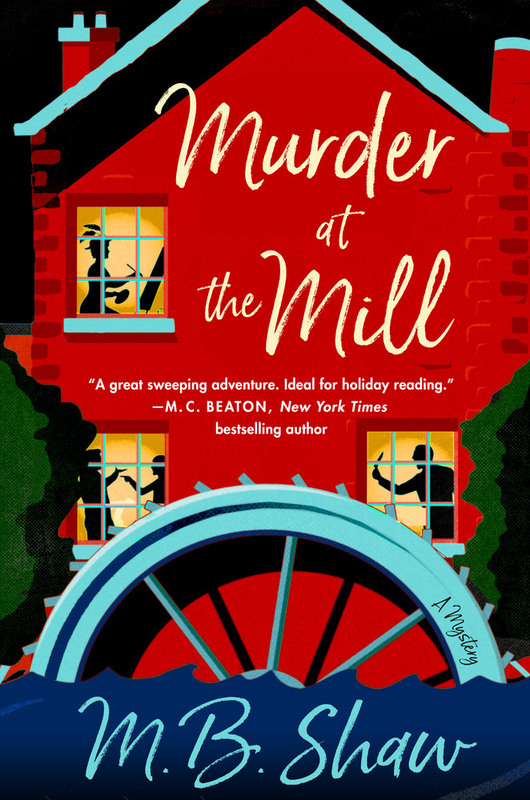 Murder at the Mill. New York: Minotaur Books, 2018. Iris, an artist, arrives to paint a portrait of Dom Weatherby, and finds him dead following a party on Christmas day. At first the local officers presume it to be suicide but when the toxicology report shows chloroform, she knows her hunch it was murder is correct. What follows is a rather convoluted plot. Although the book improves as it goes along, I failed to connect with the amateur sleuth and the official investigators seemed too far removed from the investigation. Another thread follows an older case which was determined to be suicide but provides motive for the current one. Iris also determines a wrong conclusion in that case, finding the guilty party. The similar circumstances make the plot too unrealistic. I received an advance electronic copy from the publisher through NetGalley in exchange for an honest review. Jansson, Susanne. The Forbidden Place. Translated by Rachel Willson-Broyles. New York: Grand Central Publishing, 2018. Nathalie, a biology major, returned to her Swedish hometown where her parents died in what was believed to be a murder-suicide. She's come to study the plant life in the bog. Things change when she finds a friend seriously injured and left for dead in the bog. Soon bodies are discovered in the bog. I was disappointed in this book. The solution was pretty obvious. While the police are present in the investigation, I never got a real feel for their work on the case. The novel seemed too focused on other aspects. While the author tried to provide a dark atmosphere, she never really achieved it. If you are looking for good "dark" Scandicrime, look elsewhere. I received an electronic copy through NetGalley with the expectation of an honest review. Besides the pursuit of family history, I also enjoy Southern Gospel and country music, reading mysteries, travelling, cats, and cross stitch.